Sushi is one of the Japan’s most well-known dishes, but do you know Japan has many types of sushi? Japanese people don’t eat nigiri – vinegared rice topped with raw fish – very often. Rather, Japanese people commonly eat “Chirashi-zushi” which consists of a bowl of sushi rice topped with a variety of ingredients. In essence “Chirashi-zushi” means sprinkles. I’d like to introduce you to this dish mostly because many Canadians may not know about it. Basically you can add any ingredients you like in Chirashi-zusi. In Japan, it is different from region to region. Often regional foods are used as toppings. Japanese people are well known for their longevity and this food could be the key to maintaining good health. If you are curious, I really recommend that you try it! 1) To make the vinegared rice, mix the rice with the vinegar, sugar and salt. 2) After salmon has cooled, add it to the rice. 3) Add shiso leaves and sesame seeds. 4) Squeeze lemon juice over the salmon. 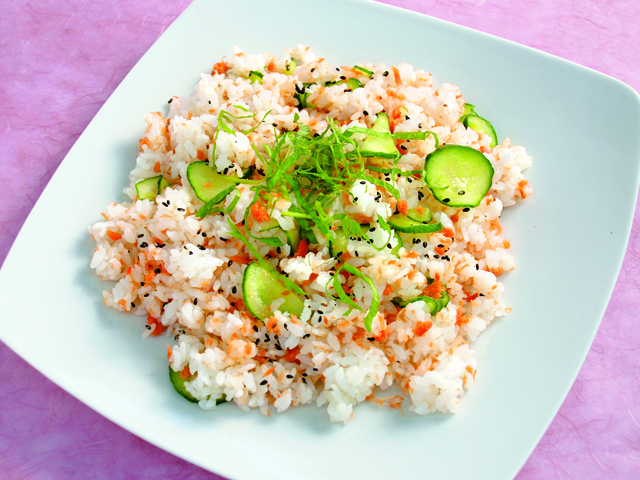 5) Mix all the ingredients together, and you have Chirashi-zushi.